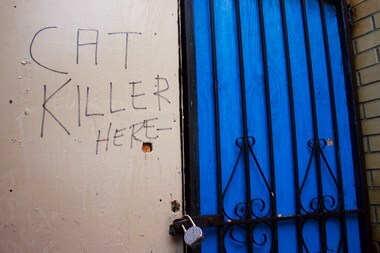 Someone wrote the words "Cat Killer Here" on a piece of plywood between two of the buildings. ASTORIA — A row of vacant buildings that's home to a number of feral cats is likely to be torn down, Department of Buildings records show. The owner of the five empty properties, located on the corner of Hoyt Avenue South and 29th Street in Astoria, filed applications in July to demolish the buildings — a hangout for about 10 to 12 stray cats that residents regularly leave food for, locals say. Construction scaffolding was erected at the site earlier this month, and a piece of plywood between two of the buildings has the words "Cat Killer Here" scrawled across it. "I think some people got upset," said Zohar Saadi, the owner of Pets on the Run, a pet supply store a few doors down from the properties who said he's one of several people who feed the animals. He said he doesn't know who penned the message. He said the plywood had been put up to cover an alley where caregivers would leave bowls of food, making it harder for them to access the cats. "I feed them on a daily basis," he said, adding that he's worried about the upcoming construction. "I don't know what's going to happen to these cats." Demolition permits have yet to be issued for any of the sites because the DOB has not yet reviewed the plans, a spokesman said. The buildings are owned by United Nu-Land Development LLC, city records show. A property manager for the company declined to comment and said the owner was unavailable this week. It's not clear how long the empty buildings have been frequented by strays, though a thread on a local message board about the cats suggests they've been spotted at the building since at least 2009.